Have you long loved stopping by Kringla Bakeri og Kafe in Epcot’s Norway Pavilion and ordering a Rice Cream, Lefse, Berry Cream Puff, or School Bread? And if so, were you bummed out these past several months while the Bakeri was closed for refurbishment? 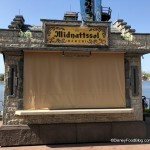 Because even though you could purchase select offerings at the temporary Midnattsol Bakeri kiosk, it just wasn’t the same… right? Well, be bummed no more! 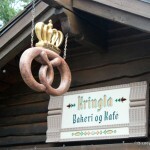 Because Kringla Bakeri og Kafe has reopened as of today! The refurbishment is over, and we can now see the results of the work. 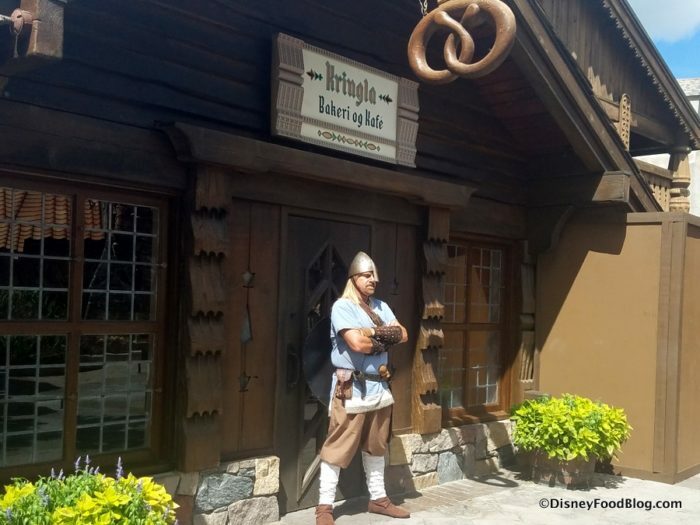 Although, before we could do that, there was a Viking Guard standing by, protecting Kringla into the afternoon of today’s reopening! But at last it was time for the Opening Ceremony with the Cast Members! NOW let’s enter those doors! At first glance, it does not appear that much has changed at the Kafe, with the classic sign hanging over the door. But things have indeed changed, and it starts right when you step in. 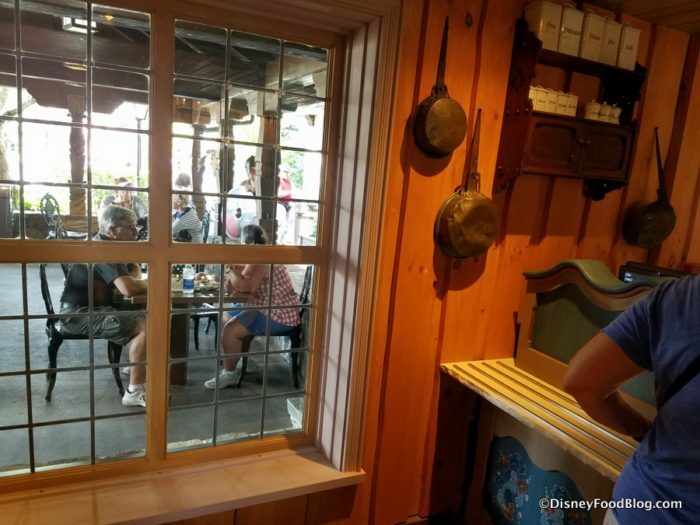 Remember how it used to be when you would walk in through the door which (quite understandably) other guests entering didn’t always realize was the end of a line rather than a stroll into a shop and suddenly everything would kind of seize up and everyone would bump into each other? Not the best way to explain it, I know. But if you’ve been there, you probably get where I’m coming from. Anyhoo! In speaking with a manager — and as it obvious from the new presence of line columns — an improvement to flow inside the shop was one of the main things the refurbishment was focused on (along with a kitchen expansion, which resulted in taking some of the retail shop’s space to make some more room). In fact, the store has been doubled in size. 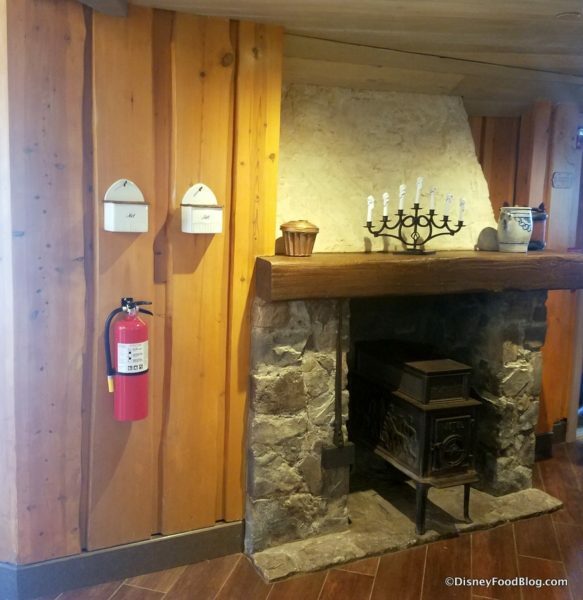 Sure, the line changes may take a little of that “at home” feel away, but overall it’s an improvement to the function that has been needed and will make guests a lot more comfortable in the long run. Plus, the plentiful finishing touches full of Scandinavian charm still complete the scene and help everything to feel cozy and familiar. As do the friendly Cast Members, as always! Another change to the flow is exiting the line once you have your order in hand. 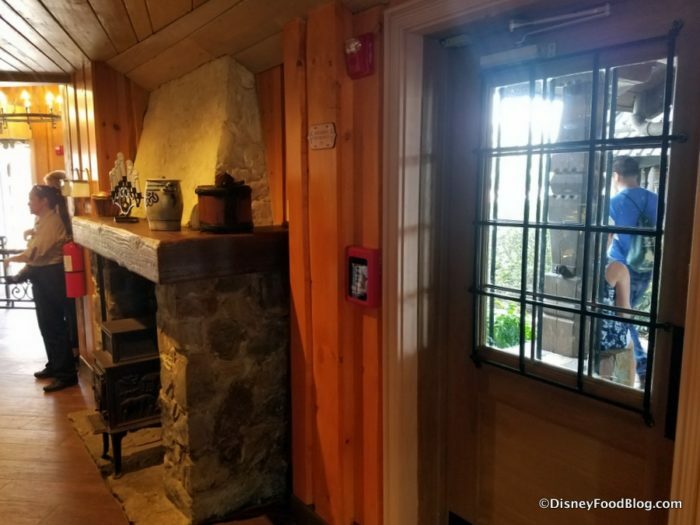 Remember where the old door leading out directly to the seating area was? A window is there now, letting in some better light flow. But, of course, you can access the outdoor area by THIS door. It’s all still there (without expansion or too much change aside from access points), offering you some shade in which to sit and enjoy your food! Longtime Kringla Bakeri fans, rejoice! 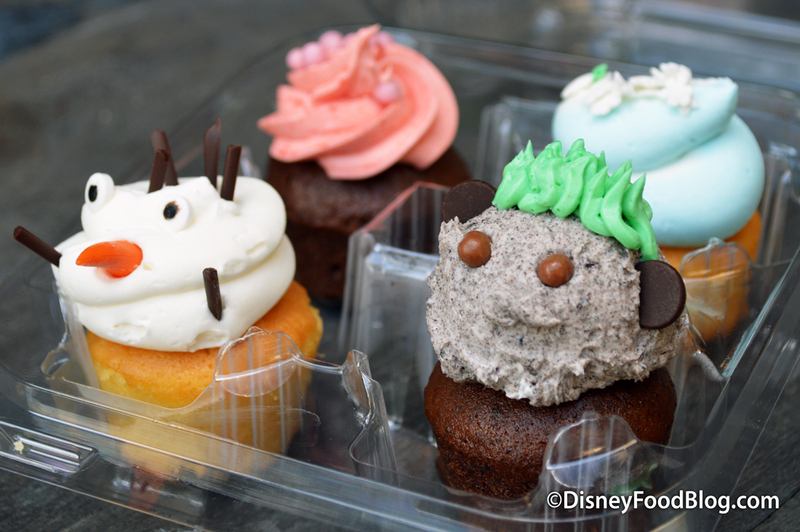 You’re about to see a LOT of familiar offerings back at the Kafe! 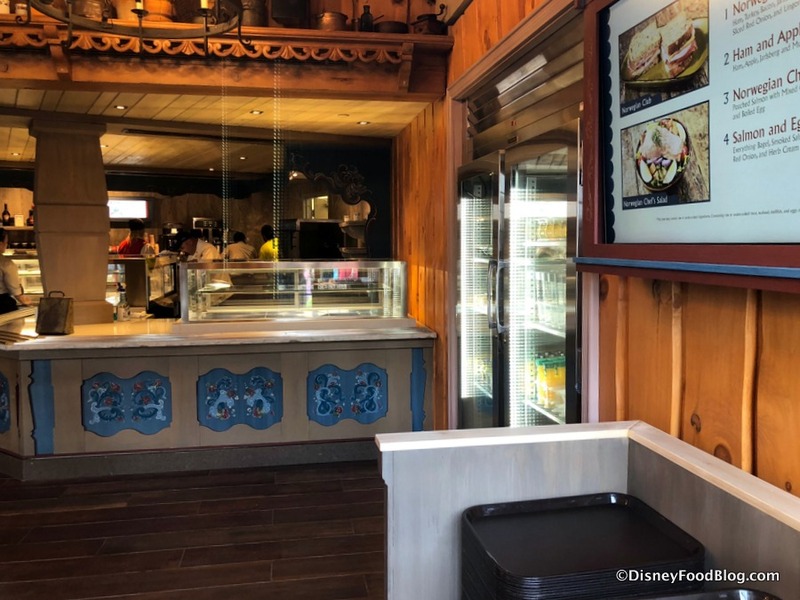 After the debut of the Viking Dog at Midnattsol Bakeri (the temporary kiosk in Norway during the refurbishment), we were curious if some more quirky and even heartier fare might be featured on the menu and in the bakery case after the refurb. 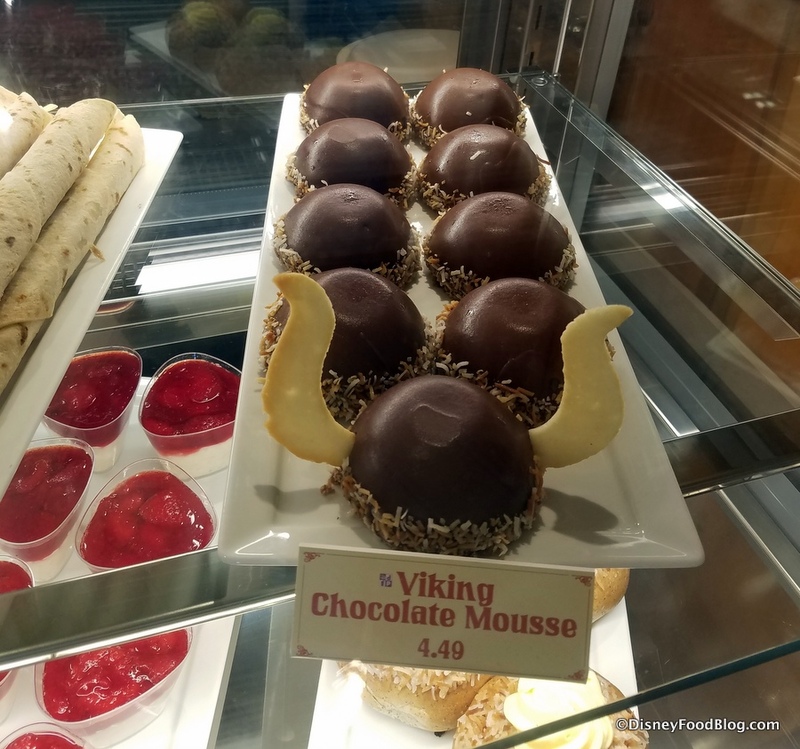 But the emphasis (aside from a few now-familiar Frozen-themed snacks) remains on the more traditional side of things as far as Norwegian treats go. Guests looking for more of a meal will still find sandwiches like the Ham and Apple Sandwich, Salmon and Egg Bagel, and Norwegian Club and Chef’s Salad on the entree menu. But Kringla was always better known for its bakery — whoops! I mean bakeri — case. And here you’ll find plenty of returning favorites, like the Rice Cream, Berry Cream Puffs, Viking Chocolate Mousse, and sweet pretzels (Chocolate and the Sweet Pretzel with Almonds — plus, a Cinnamon!). 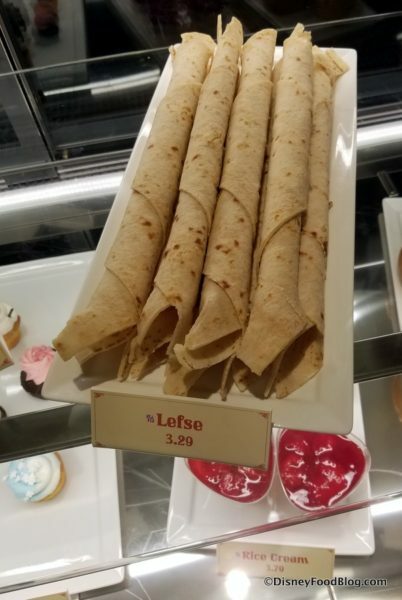 Here you go, Lefse diehards! And all the little — and not-so-little Frozen fans will still find the Quartet of Frozen Mini Cupcakes. 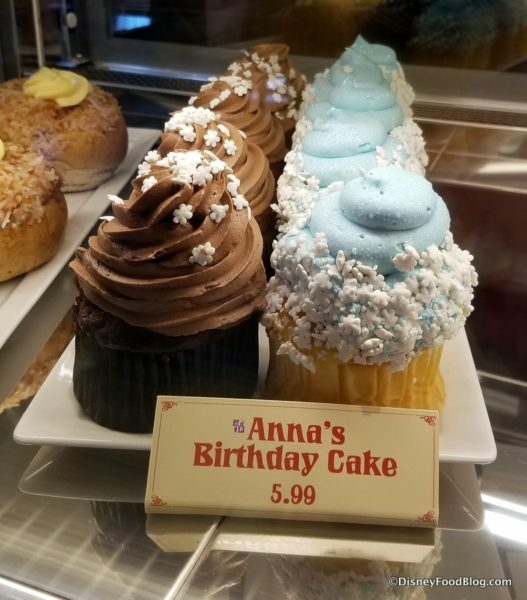 Plus, it’s still Anna’s Birthday everyday at Kringla! 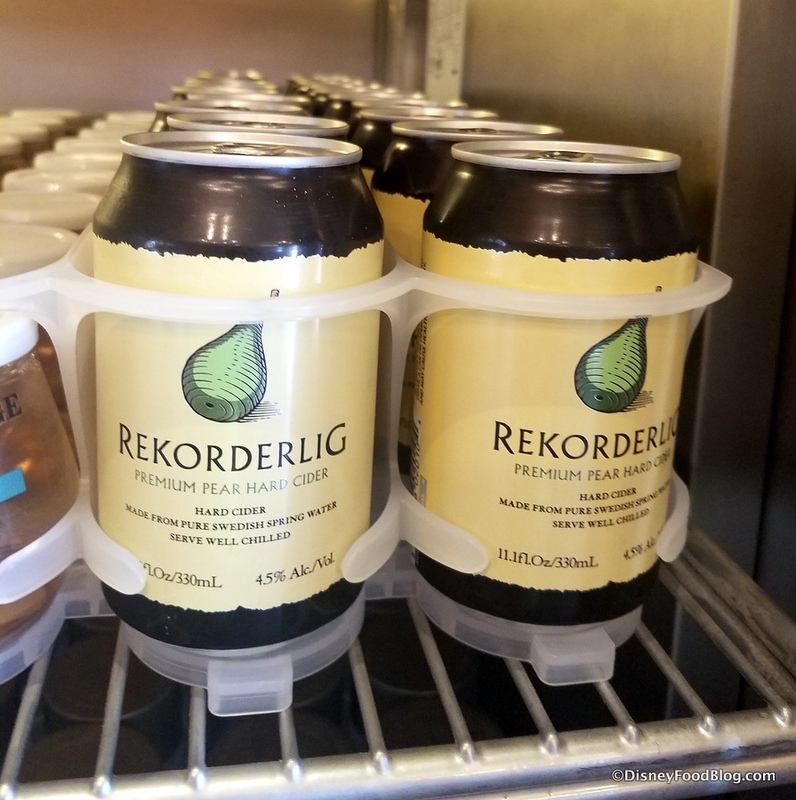 Drinks still include Viking Coffee (with Kamora Coffee Liqueur and Baileys Irish Cream) and you’ll find Nordic Draft Beer like Einstock White Ale and Toasted Porter as well as Aass Pilsner on the list. Rekorderlig Hard Cider can be found over in the chilled beverages, along with other options. What’s missing? 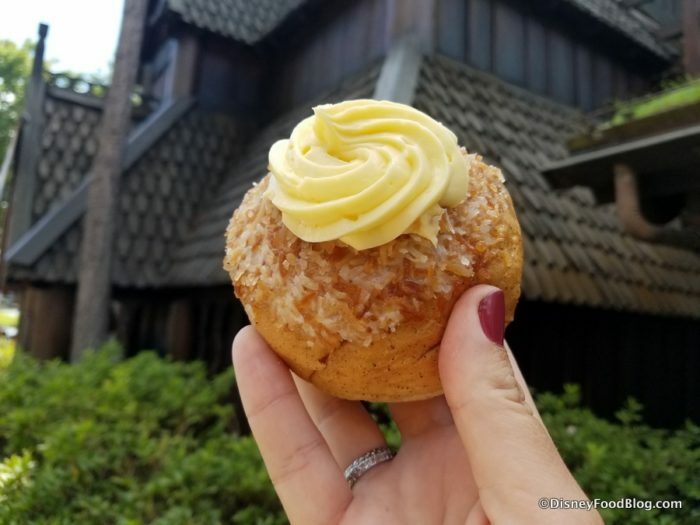 Well, for one… that Cinnamon Loaf we fell in love with when Kringla began serving breakfast once the Frozen Ever After attraction opened. We asked a supervisor and though she said she wasn’t 100% sure it’s gone for good, it’s not here now. It “may be a stay tuned” item. We sure hope so! In the meantime, though, check out the Cinnamon Pretzel! 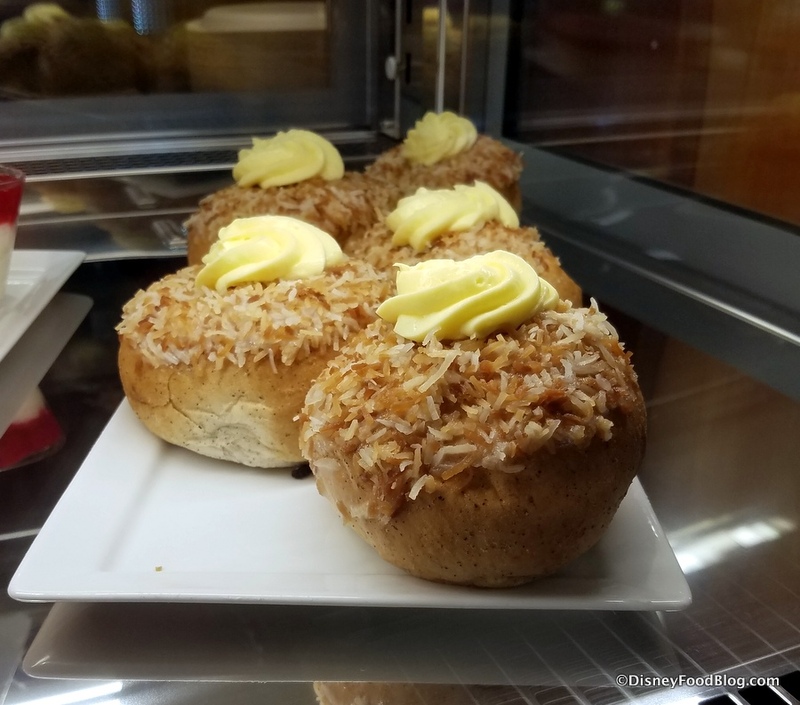 But, it’s hard to worry too much about that when School Bread is back where it belongs… at the newly reopened Kringla Bakeri og Kafe! 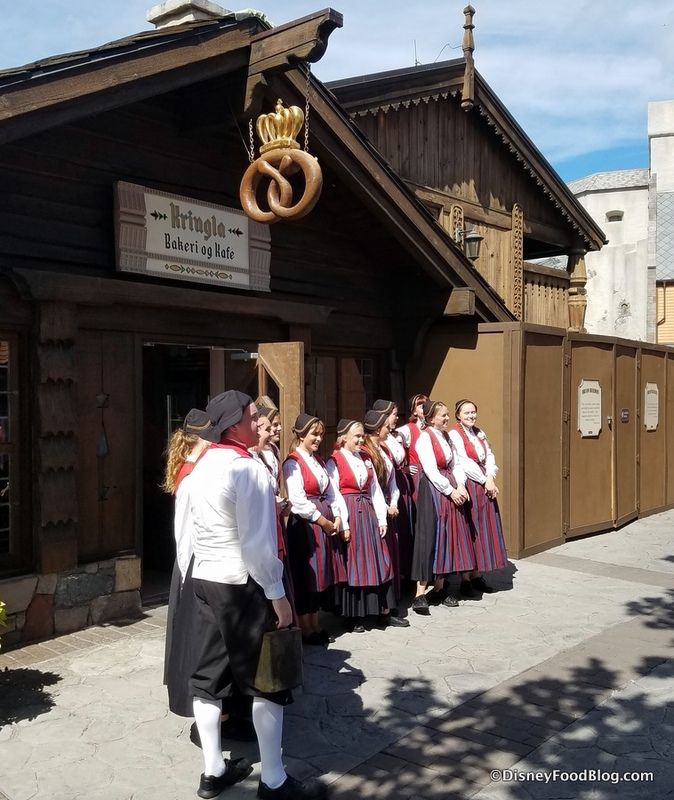 For now, it’s Ha Det from the Norway Pavilion! 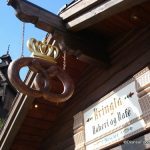 Take a Food Tour of the Norway pavilion in our DFB YouTube Video! What do you think of the refurbished Kringla Bakeri og Kafe? Please let us know with a comment! Is it just an illusion or is the school bread much smaller than it used to be? Yay, was hoping one of my total fav’s would be open for Oct trip. Now, where is the Rullekake?????????? Did they start making the school bread smaller? I was wondering the same as Nicole. The school bread looks smaller. I’m hoping that you have unusually large hands, as that school bread looks rather small. Another popular and shareable item that they shrunk for profit sake? I hope not. I’m so excited for those savory items too! It’s all about the lefse for me. Lefse is where it’s at. My wife just informed me she prefers my lefse, but a trip to Norway wouldn’t be complete without at least one, if not usually two (kids and wife always seem to want a bite, so better to get them one to split while I enjoy my favorite treat). I was so hoping they would bring the rullekake back when they reopened. Alas, I shall continue lamenting the loss. Bring back the meatballs, PLEASE!!!! No troll horn?? 🙁 that was my favorite…add to my list of snack change disappointments for my upcoming trip in November. 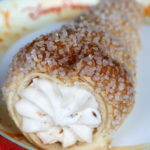 First the caramel shortbread changes at Karamel Kuche, then the carrot cake cookie changes at HS, and now the troll horn? Leave my favorite snacks alone! 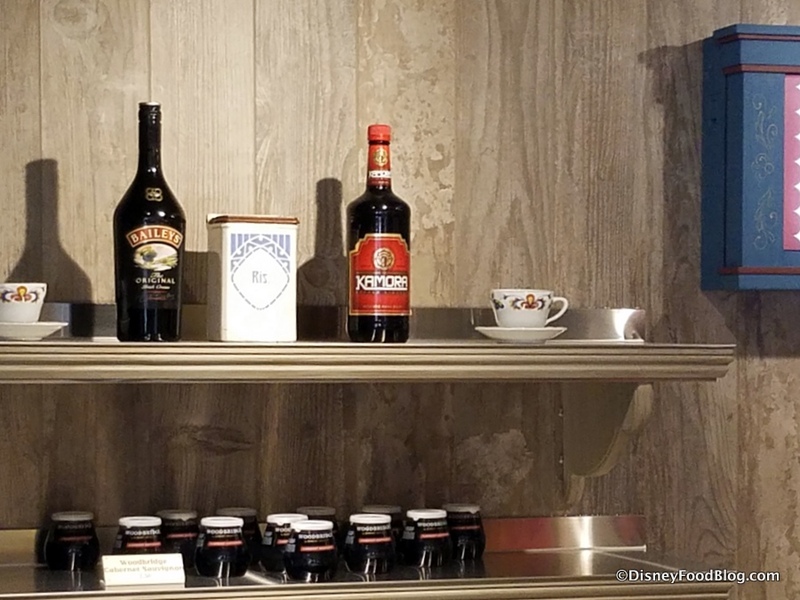 Do they still have Aquavit? Much relieved that School bread and rice cream are back! 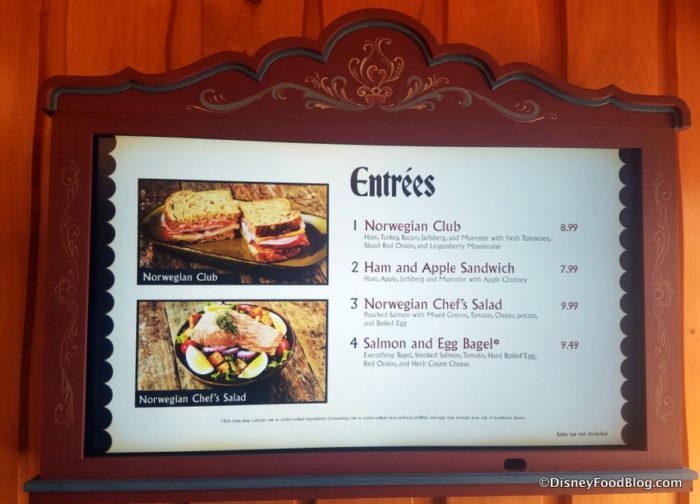 Need Danish hot dogs and Swedish meatballs added to the menu immediately! Once menu is perfected, please write no more articles publicizing the wonders of this gem… we don’t want the lines to be as long as they should be! I love all things Disney; always have and always will. That is not to say that I don’t believe Walt is spinning in his grave over some of the changes WDW has been making during recent years. 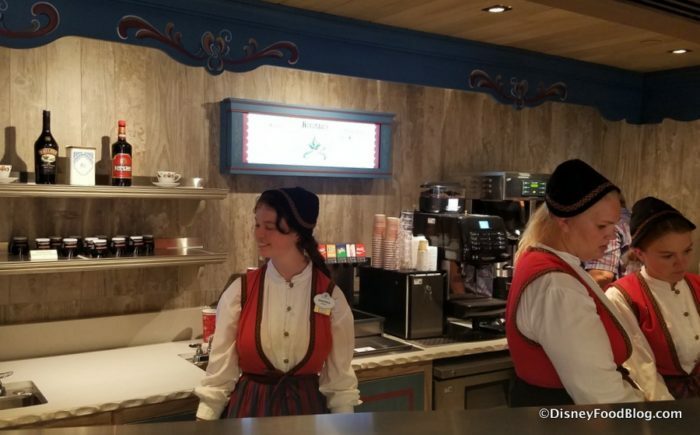 The Norway pavilion should have been left alone, as and about Norway, not about the children’s movie Frozen. Frozen as an attraction belongs in Fantasyland at the Magic Kingdom, not on the World Showcase. 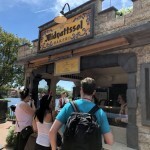 It caters to people with children, which is fine and is certainly WDW oriented, but on the World Showcase, it detracts from that which was meant to entertain adults and educate all of us. I am happy to see that the Kringla hs been expanded, but why are the menu and certain individual items, such as School Bread, smaller?!? My late husband and I used to love to share the open-faced sandwiches. They were out of this world, especially the cold scrambled egg and smoked salmon on (rye?) bread! The new Salmon and (hard boiled?!) Egg Bagel does not and cannot compare, and at $9.50 you will never see me buy one. Thank goodness the lefse still appears to be a decent sized menu item, even if it is more money than prior to the remodeling. PLEASE! 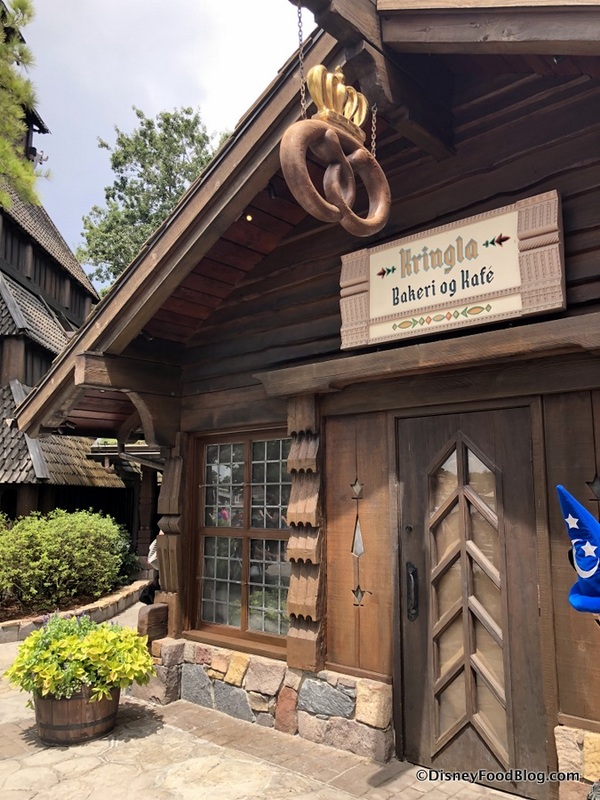 I’m begging Epcot not to make any more changes to the Kringla menu. I will not stand in line 1-2 hours for the Frozen ride I know i will not enjoy and if you change the menu any more, there will be no point stopping in Norway at all. Speaking of menu changes, a change for the better would be to offer servings of buttered spaetzle along with the bratwurst in the outdoor stand and at the Germany booth in the Food & Wine Festival. It will cost what is for me a fortune just to attend the F&WF, never mind another $30 for the buffet in Germany just to have the treat of eating spaetzle. I was wondering if the almond pretzel and strawberry waffle is still offered. My family absolutely loved them! We would buy one of each bakery item offered and share them among the six of us. That way we all got to enjoy the deliciousness of Kringla!!!! What time does the bakery open? I am a troll horn and meatball lover! Many a time I got them to go to have in our room later. Hopefully they will make it back on the menu. I am delighted the Einstok pale ale is there so not to have to stop outside again to get that delicious drink! Very disappointing! No Troll horns and no Cinnamon loaf!!! Why even go?? Great post! I’m also wondering about the size of that school bread! It looks miniature! Is there a mini version in addition to the regular-sized option? I hope, I hope! I so agree with Lorraine’s comments. 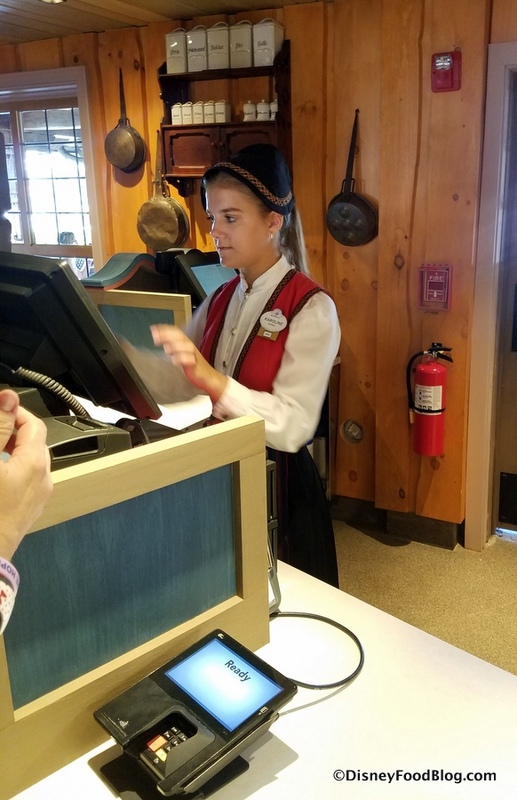 As for my family, the changes Disney has made in recent years to Epcot, especially the Norway pavilion, are keeping us away from one of our favorite vacation spots. I remember years ago when one of the best bakery items was the “Veiled Maiden,” a scrumptuous parfait layering of fresh applesauce, cinnamon, and fresh whipped cream. Now you can’t even find a cast member who knows what you are talking about. The school bread is great stuff, but decreasing the size is about par for the “new Disney” approach to marketing. 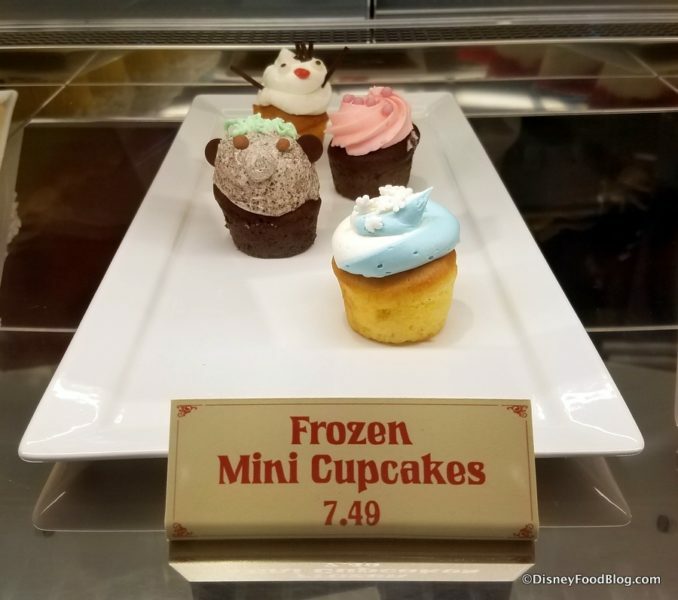 Changing the attraction to “Frozen” must certainly have Mr. Disney churning in his grave as the whole concept of Epcot stressed exposure to diverse cultures and education about them. In our opinion, they started down a very slippery slope in Norway when they changed the restaurant to a sit down menu instead of the wonderful smorgasbord offered for so many years. 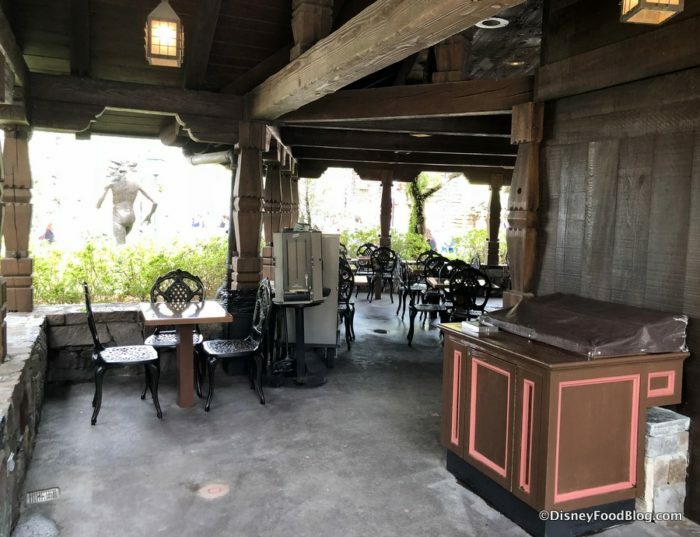 Other changes around the park, like the demise of all the intellectually stimulating technical displays near the front of the park, echo this abandonment of purpose. It is all about money now. Add to this the obscene gouging for parking that has been put in place for those staying at a Disney property and the result is very little motivation to make the trip anymore. Instead of leaving the park at the end of the day with that wonderful exhilarating feeling we once had, we now feel disgusted and sick that we allowed ourselves to be fleeced once again. This family has decided to go elsewhere. I’m with Dave above: where is the rullekake????!!!!! It was an amazingly light and refreshing dessert. Very Disappointed not to see the Troll Horns. They are a family fav! 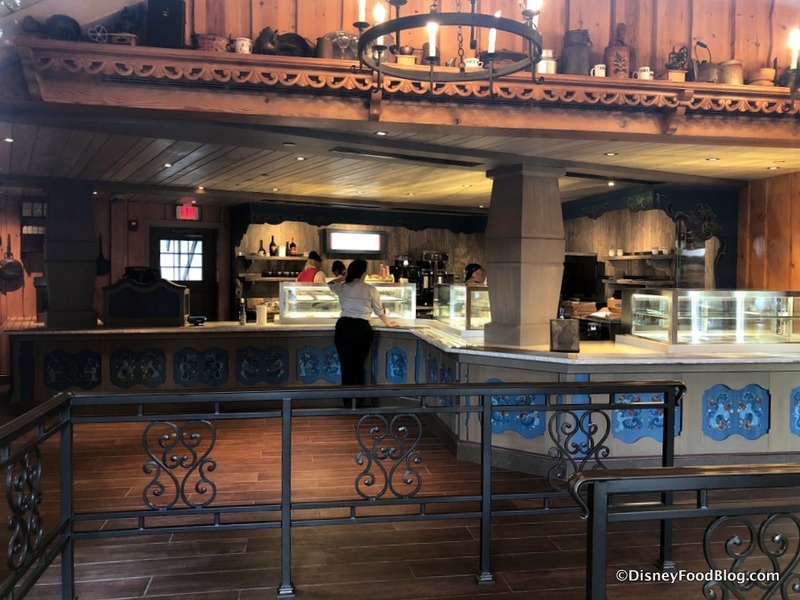 I am happy with the refurb changes to the bakery area as it was just too small but I hope the cast members are more efficient about moving the line along now that it’s not so crowded. They have to be the slowest in service compared to all the other countries. So happy the rice cream is back!!! Joann, they may reintroduce the Troll Horn, as menus are always subject to change! We’ll keep checking. Michele and Dave: Keep checking! The menu is subject to change (always! ), so maybe it’ll come back! Kathy D., the School Bread is about the same size it used to be. No miniature version (although that’s an intriguing idea!). Che: Kingla Bakeri og Kafe opens at 9AM! Rosemarie, neither of those items is on the menu, however that’s always subject to change. We’ll be checking in to see how things unfold now that the doors are open! Julie, we didn’t see it on our visit, but that doesn’t mean it won’t be back. We’ll check! Lindsay, I know it’s not much consolation, but we did love the Caramel Pecan Bar at Karamell-Kuche! And we’re keeping an eye out to see if the Troll Horns return! The School Bread may vary a bit in appearance from day to day. We’ll keep watch to see if it’s noticeably smaller over the next few weeks! However, I’m not happy with these design changes. 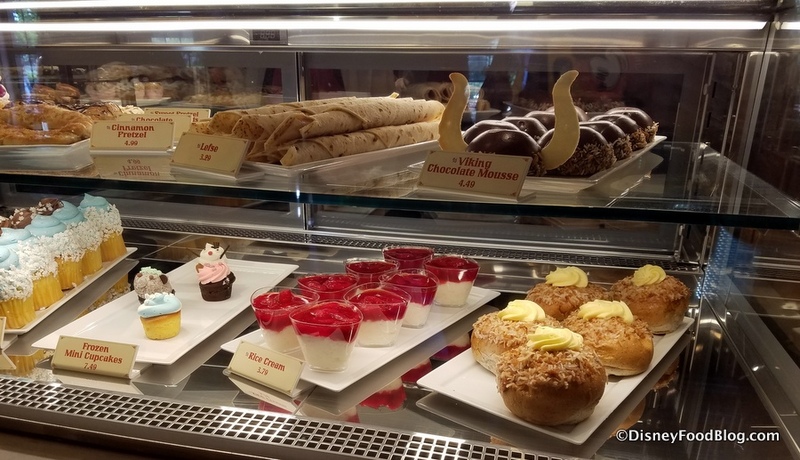 I loved the intimate feel of the old design – you felt like you really were going into a little village bakery within the cramped, but lovely setting. This new design just feels like an industrial remake with some props thrown back in (and that new wall just looks cheap to me – at least in the photos). As a former CM, I’m not pleased with so many of the changes being made to the parks. I realize change happens and even Walt said that change is inevitable, i.e. “progress is impossible without change.” However, I just don’t care for the KINDS of changes being made. Oh bummer, don’t they have the plate with olives, cheese, and meat on it anymore? Yep, the school bread looks smaller in my opinion too. 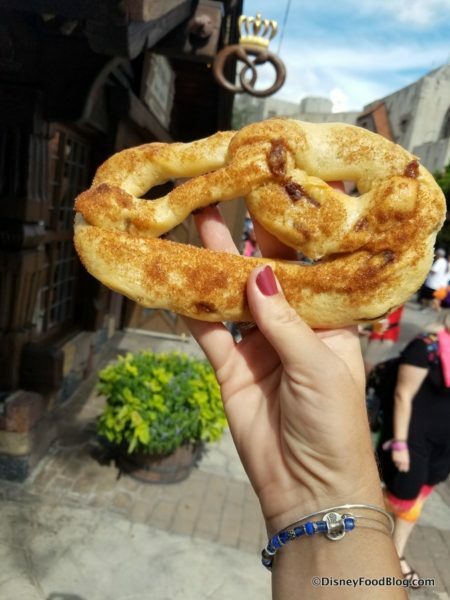 I am not usually a big pretzel fan but the almond pretzel here and the ham and cheese pretzel at Gaston’s in MK are excellent! I’m hungry now. school bread is definitely smaller, purchases today. As of last week, still no Troll Horn. The Cast Member said they were no longer making them. I’m so disappointed. 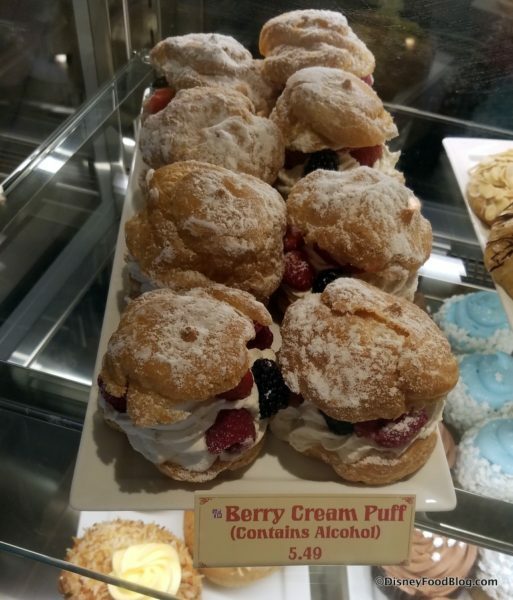 Any idea what the alcohol is in the Berry Cream Puff? Or how it alters the taste of the whipped cream now?